The award system is based on our user tag system (Admin -> Users), so you will first need to create or edit a user tag to start using awards. In the edit tag window, you will see a new awards tab where you can setup your award. After you have started adding awards, you may want to manage them. The best place to manage awards is the Award Manager section of the admin panel, located Admin -> Users -> Awards. From here you can manage the awards separately from their associated tags. You have options to edit, move and see any assoited user/tag information. Awards themselves are not automated, but the tags they are based can be automated. 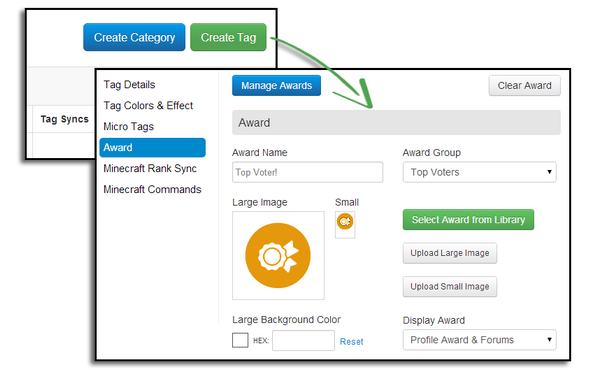 You can set up an automated award system by going to Admin -> Automations and creating automations to tag users with a tag currently set up with an award.